Hotel near Canary Wharf Railway Station. 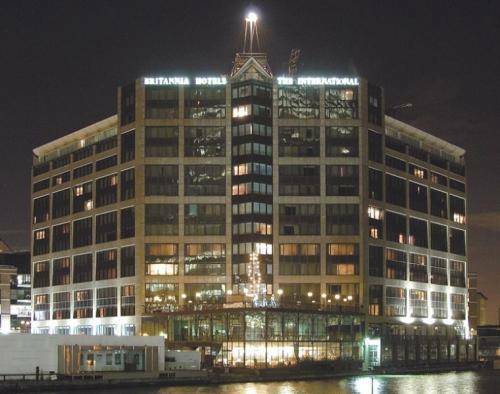 The International Hotel is situated in the heart of London's Canary Wharf near Excel and close to the Jubilee line. The hotel is only minutes from South Quay on the Docklands Light Railway and Canary Wharf on the Jubilee. CANCELLATION POLICY: Reservations must be cancelled 1 day in advance of your arrival date. In the event of a no show or a cancellation in breach of this policy, the cost of the entire reservation will be charged. The cancellation policy may vary per room type; please check the room description as well. COMMENTS: A credit card is required as a guarantee. If the booking is not cancelled outside of the cancellation notice period, your credit card will be charged with the full amount of the booking. From Tower Bridge Take the Docklands Highway (East Smithfield) towards Isle of Dogs and City Airport. Proceed through the Limehouse Link Tunnel and take the first exit - signposted Canary Wharf, Isle of Dogs. Turn right at the junction and continue on to Marsh Wall. From M25 Leave M25 at Junction 27. Join M11 south. Continue to the end of M11 and follow signs to A406 Docklands Isle of Dogs and connect with A13. Follow signs to the Isle of Dogs. The hotel sits to the south of Canary Wharf on Marsh Wall. By Eurostar: From Waterloo take the Jubilee line and stop at Canary Wharf By Rail The Hotel is situated 3 minutes walk from the Canary Wharf Jubilee Line station. Alternatively, connections to Docklands Light Railway (DLR) can be taken from Bank and Tower Hill stations on the London Underground. The Hotel is situated only 3 minutes walk away from Heron Quays and South Quay stations.